Taste test: These are pretty good. They're not terribly spicy, but they're quite flavorful, with good cajun taste. 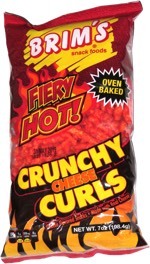 When I bought these, along with a bag of Zapp's Hotter 'N Hot chips, the clerk warned me that I should buy a cold beverage as well, because the Hotter 'N Hot chips are quite hot. Well, I didn't buy a beverage, and it turned out that they're not that hot. Smell test: A good spicy cajun barbecue smell. 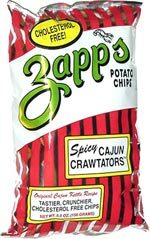 Trivia: That new search engine "Google" won't find this site when people search for "Zapps" (without the apostrophe) unless we spell it Zapps. This snack was discovered by Mary.